In continuation of National Volunteer Week, we would like to introduce you to another one of our volunteers, Linda Lee. 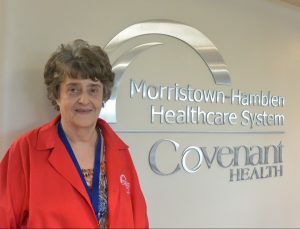 Linda has been a volunteer at Morristown-Hamblen Healthcare System over 26 years. While volunteering on Fridays and other days as needed, she will greet you with a warm smile and cheery disposition as you come in the hospital front entrance. Before volunteering in the MHHS front lobby, Linda helped out in the day surgery waiting room. Linda loves to collect dolls and has a large collection. She is a proud mother, grandma, and great-grandma with three children, four grandchildren, and one great-granddaughter. She loves to visit them. Linda is also very involved in her church, the Morristown Seventh-Day Adventist Church, and is co-leader of its Women’s Ministries. Linda is also part of the Heart-to-Heart widows group. We hope you enjoyed getting to know Linda Lee and stay tuned for the next Volunteer Appreciation Week spotlight. If you are interested in exploring the possibilities of being a volunteer, please visit www.morristownhamblen.com/volunteers.